One of the oldest cities on the banks of Yamuna, Vrindavan is considered to be one of the most important places of pilgrimage for the devotees of Krishna. It is said that Lord Krishna had spent his childhood in Vrindavan. The name of the city has been derived from Vrinda (meaning basil) and van (meaning grove) which perhaps refer to the two small groves at Nidhivan and Seva Kunj. Since Vrindavan is considered to be a sacred place, a large number of people come here to abandon their worldly life. The city of Vrindavan hosts hundreds of Lord Krishna and Radha temples scattered throughout, the most famous ones being Banke Bihari temple, ISKCON temple. The vibrant surroundings perfectly depict the playful and benevolent nature of Lord Krishna. Located along the waters of River Yamuna, the numerous temples set amidst the thick woods and lush greenery of Vrindavan are the major attractions here. Also known as Vrindavan, this city derives its name from the groves of Brinda and Vana meaning forest. Shri Banke Bihari Mandir is a Hindu temple dedicated to Lord Krishna in the holy city of Vrindavan in the Mathura district. One of the most revered shrines in the country, this temple is among the 7 temples of Thakur of Vrindavan which also include Sri Radhavallabh Ji, Shri Govind Dev Ji and four others. As you come in the presence of the Banke Bihari Temple, you are confronted with the stunning Rajasthani- style edifice of the temple, which is adorned with arched windows and meticulous stonework. The image of Lord Krishna in the temple appears in the form of a child and is seen standing in the Tribhanga position. One interesting fact about the Banke Bihari temple is that there are no bells or conchs in the premises, as the Lord does not like the sound of these instruments. Divine invocations are performed by peaceful chants of 'Radha Naam'. The word 'Banke' means bent in three places, while the word 'Bihari' means supreme enjoyer. The idol in Banke Bihari Temple was originally worshipped under the name of Kunj- Bihari which means enjoyer of lakes. The sewa of the Bihariji is unique in its own way. It is performed in three parts every day ie Shringar, Rajbhog and Shayan. While Shringar (which includes bath, dressing and adornment with jewellery like crown and necklaces) and Rajbhog (feast) are offered in the forenoon, Shayan Sewa (Shayan means sleep) is offered in the evening. One of the holiest places when it comes to the worship of Lord Krishna, the Banke Bihari Temple is thronged by devotees all through the year. Imbued with elegance and grandeur, the Prem Mandir is a massive temple that was shaped by Jagadguru Shri Kripaluji Maharaj in the year 2001. Known as "the temple of God's love", this grand religious place is dedicated to Radha Krishna as well as Sita Ram. Located in Vrindavan, the holy city in the district of Mathura in Uttar Pradesh, the temple is enveloped with piousness and serenity. This newly constructed temple is the most beautiful in the entire Brij area and is crowded with devotees during the time of the Aarti. Made out of white marble and adorned with very intricate carvings, this temple is also famous for its architectural beauty. Statues of Shri Krishna and his admirers, portraying essential occasions surrounding the Lord's life, cover the main temple. Various scenes from Krishna's life, like raising the Govardhan Mountain, have been depicted on the periphery of the Prem Mandir. The lighting of the temple further glorifies its spectacular look, especially during the night. The cafeteria located on the premises of the Prem Mandir serves all vegetarian food. The temple was built at a total cost of INR 150 crores and took over eleven years to complete! A grand pillar-less complex is being built next to Prem Mandir, which can lodge 25,000 people at a time. Another fantastic and attractive feature at the Prem Mandir is the musical fountain. The musical fountain, along with the spectacular light display, leaves hundreds of people awestruck. The colored water twists and twirls to the tunes of the kirtans of Radha Krishna being played nearby and are an audio-visual delight. Also known as Sri Krishna-Balaram Mandir, this temple was built in 1975 on the instructions of Bhaktivedanta Swami Prabhupada, who is the founder-acharya of ISKCON. The core objective of this temple was to increase awareness about the Vedic scriptures and the Bhagavad Gita. Even today, it is regarded as one of the most popular temples in Vrindavan. The three altars here are the seats of Sri Sri Gaura Nitai, Shri Krishna and Balaram and Sri Sri Radha Shyamasundara along with Lalita and Vishakha. The presiding deity of the temple, however, is Lord Krishna-Balaram.Vrindavan is a holy place for devotees of Krishna as he spent his childhood here. There are two idols on the central slab of the temple which depict Krishna and Balarama, who were brothers. On the right dais are the idols of their friends. On the left side is a statue of Chaitanya Mahaprabhu with Nityananda, and of Bhaktivedanta Swami Prabhupada and his spiritual coach Bhaktisiddhanta Sarasvati Thakura. Krishna-Balaram Mandir implements great ethics of hygiene and deity adoration in the whole of Vrindavan. The Shahji temple was built in the year 1876 by Shah Kundan Lal, and is dedicated to Lord Krishna. The main deity here is known as Chhote Radha Raman. Its impressive marble structure features 12 beautiful spiral columns of a height of 15 feet each and also the Basanti Kamra which is a hall with Belgian glass chandeliers and intricate paintings placed within. An ancient shrine in Vrindavan, the Gokulnanda Temple houses multiple deities of Radha-Vinoda of Lokanatha Goswami, Vijaya Govinda of Baladeva Vidyabhusana and Radha Gokulananda of Vishwanath Cakravarti. Dedicated to Lord Shiva, this temple depicts the lord in the form of a gopi. This has been derived from a tale where he took the shape of a female to see the Rasa dance. Devotees pour the holy waters of the Yamuna on the Shiva Lingam here. The peepal tree here is said to be a tree that fulfils all desires. Large, ornate Hindu temple dedicated to an 8th-century Vaishnava saint, featuring regular festivals. Vrindavan Chandrodaya Mandir is the world's tallest temple under-construction at Vrindavan, Mathura, India. When completed, it will be the tallest religious monument in the world.At cost of ₹300 crore (US$44 million) it will be one of the most expensively built temples in world by ISKCON Bangalore.The temple has a footprint of about 5 acres and rises to a height of about 700 feet (213 meters or 70 floors) and a built-up area of 5,40,000 sq. ft.The temple is planned to be vibrant with festivals and religious activities throughout the year. It is going to be a must watch place for every Hindu. A look-alike of the verdant forests of Vrindavan will be recreated around this magnificent temple. It will be spread over a sprawling 26 acres, it will consist of the twelve forests (dvadashakanana) of Braj, with varieties of lush vegetation, green pastures, elegant vistas of fruit bearing trees, flower laden creepers serenaded by bird songs, clear water lakes with lotuses and lilies and water falls that tumble from small artificial hillocks - all recreated from descriptions in the SrimadBhagavatam and other source books of Lord Sri Krishna - to transport the visitors to Krishna's times in Vrindavan. The project is set in 62 acres of land and will includes 12 acres for parking and a helipad. Seva Kunj was discovered by Swami Hit Harivansh in 1590. Followers of his sampraday maintain this sacred site and offer daily pooja seva to the presiding deity. It has a beautiful temple dedicated to Radha Krishna which is also known as Rang Mahal, where Radha and Krishna used to perform Raas Leela along with other gopis of Vrindavan. The temple’s walls are decorated with paintings of various leelas performed by Shri RadhaKrishna. Each painting depicts different aspect of Radha and Krishna. One of the painting depicts Krishna combing and decorating hairs of Radha. In another painting, Lord Krishna is massaging legs of Radha after she is tired of Raas Leela. Other paintings depicts RadhaKrishna playing Holi and in one Krishna is enthralling Radha while playing flute. The temple is dedicated to the tutelary deity, Lord Krishna. It is believed that Shri Gopal Singhji got victory in the battle of Daultabad. After this the king in his dream saw that Lord Krishna instructed him to fetch his idol from Amer and installed at Karauli. The king of Karauli therefore, brought this idol and got this temple constructed to enshrine it. It is also said that to protect idols of Lord Krishna from Mughals, two idols were brought from Vrindavan and placed one at Karauli and another at Jaipur. It is said that to complete the Govardhan Yatra, it is mandatory to visit Madan Mohan Ji and Govind Dev Ji Temple. It is one of the Char Dham of Karauli District. Other three are Kaila Devi Temple, Mehandipur Balaji Temple and Shri Mahavirji. Devotees used to put the Prasad. Jugal Prasad is a kind of Bhog in which devotees offer Laddu and Kachauri. It is put once in a day by one person only. The queue for the same is around two year long. This temple is not much crowded compared to the Banke Bihari temple. Here Sneh Bihari Mandir, you can have nice darshan without any trouble as it's not much crowded. Staying facilities are also available. Situated in Gokul, a few kilometers away from Mathura is this incredible place called Raman Van or Raman Reti―whose sacred sands (reti) are redolent with the stories of a bygone era when Lord Krishna frequented to engage in divine plays (raman) with his brother, Balarama and his cowherd friends. This is also the place he chose to meet his love, Radha before embarking on their journey to Vrindavan together. Raman Reti today is a sandy locale sprawled in a spacious compound complete with a deer sanctuary, a couple of beautiful temples and a relaxing area for ascetics, saints and pilgrims alike. Besides paying reverence, spend some time simply ambling around in the complex―try to bask in the pastimes of Lord Krishna treasured in the sands of Raman Reti. Adjacent to Raman Reti is Karshni Ashram, a famous Ashram housing the ancient Raman Bihariji Temple. Dedicated to the 18th century Saint Gyandasji, the temple houses the deity of Lord Krishna in the exact form as was revealed to the saint as a blessing for his strong austerities to please the Lord. A visit to this famed temple must be on your itinerary if you are stepping in this mystical region. Shri Radhavallabh Temple is exactly located in Vrindavan District Mathura State Uttar Pradesh and Country India.It is situated near Bankey Bihari Temple. The "Tikaet Adhyaksh" of Shri Radhavallabh ji Temple is Shri Radheshlal Goswami and further his child Shri Mohit Maral Goswami and his brother Govind lal Goswami are also taking care of the temple. Shri Radhavallabh ji Temple was founded by Shri Hith Harivansh Mahaprabhu who is worshipped in the adjacent temple of Shri Radhavallabh ji which was earlier Shri Radhavallabh ji's temple but because of Mughal Emperor Aurangzeb attack on Vrindavan he was shifted to other place and then the new temple was built. The Yugal Darshan of Radhavallabh ji is considered as difficult because of rituals due to which the "patt" gets closed. This temple with Madan teer and Seva kunj with Maharasmandal are held by the Tikaet Adhyaksh and are considered as Shri Radhavallabh ji's property. In this temple Radhaashtami is celebrated largely which is a festival on the birthday of Shri Radha Rani . The Temple of Shri Radhavallabh lal is also the mighty temple as many people confirmed that The Lord there residing is living power while others feel a real relaxation on having the Yugal Darshan of Radhavallabh ji. It is also a popular name of Krishna, meaning the consort of Radha.Shri Radhavallabhlalji is considered as Krishna as well as Radha in one. The appearance of Lord-Krishna, the reincarnation of the almighty with complete "sixteen-kala" avtar with his Divine-love consorts Sri Radha more than five thousands year age in "Brij-India"; is a well accepted fact of life by the people of India and not a mere legend of Historians. In the lap of nature, in Vrindavan with its cluster of forests and meadows surrounded by the revered river Yamuna, the almighty mingled with the people of the land, making on destination of cast and creed. The purest form of divine love play with Sri Radha displayed by him, opened up the most secluded, rarest and the super most path of "Ras-Bhakti", hitherto unknown to the world. Shri Radhavallabhlal temple is one of the icons of Vrindavan with extraordinary beauty, building style and wonderful darshans of deity. The Lord is considered as living with unearthly powers. Many people from far away come to seek the darshan of Thakur Ji. The forces of creation and sustenance, in effect Mother Nature herself, reincarnated around Him as Sri Radha, and her companions. Lord Krishna’s haunting flute sweetest melodies was the call of God and followers happily abandoned worldly attachments to serve God and joy in this garden of nature. The queen requested a special place for herself and her Manipuri friends to reside in the holy place of Vrindavan, so they acquired the neighboring property and called it Manipuri-Rani Kunja. It was a large property with beautiful, exotic, native trees. They constructed a temple and established the deities of Sri Sri Radha Vraja Mohan, honoring the beloved deities of Srila Narottam Das Thakur who was the founder of the Vaishnava movement in Manipur in the 16th century. A platform was established there to conduct the Rasa Lila performances in Manipuri classical dance style for special occasions since Indian traditional art had been always a part of Hindu temple worship. Here it should be noted that the traditional way of performing Rama Lila (the essential artistic expression of the Ramayana) is recognized as a Masterpiece of the Oral and Intangible Heritage of Humanity by UNESCO. Vrindavan, and especially Vrinda Kunja Ashram, was and still remains a part of this. The queen herself lived in her Manipuri-Rani Kunja for many years, and there she performed her spiritual service. Kesi Ghat, situated on the bank of Yamuna River, is a famous tourist attraction in Vrindavan. The history behind its popularity is that Lord Krishna, after killing demon Kesi took bath at this ghat. Since, then devotees take a dip in the water and seek divine blessings. Every evening ritualistic aarti is done for Yamuna Devi at this ghat. A big, large and beautifully designed statue of Maa Vaishno Devi. In this temple you will find all the Nine Avtaars of Maa Durga in a cave made over the temple. The water flows all over the floor of the cave. A memorable temple that I have ever seen. The Vaishnava temple Govind Dev Ji is situated in Jaipur in Rajasthan state of India. It is located in the City Palace complex. The temple is dedicated to Govind Dev Ji (Lord Krishna).This temple is among the 7 temples of Thakur of Vrindavan including Sri Radhavallabh ji, Shri Bankey Bihari Ji, Shri Govind Dev Ji and four others. The image of the deity (murti) was brought from Vrindavan here by Raja Sawai Jai Singh II, the founder of Jaipur. According to popular legend, Lord Krishna's image in the temple looks exactly like Krishna's form during his incarnation on Earth. Starting with the morning aartis at 4.30 am this place also has an automated food handling and processing factory that is used to feed the hungry school going children ! Because the children get their free meals in school their attendance also has gone up and hence education has received a boost!! Katyayani Peeth Temple, situated in the beautiful and peaceful town of Vrindavan, is one of the Shakti Peeths of India. states that Daksh Prajapati, the father of goddess Sati, had organized a Yagya, in which he did not invite Sati’s husband, Lord Shiva because of his own ego. Sati went to this event uninvited. There she realized that her father and other gods were insulting her husband. Because of this she jumped into the fire. When Lord Shiva came to know of this, he was enraged. He went and destroyed the Yagya and took the burnt body of Sati and performed his famous Tandav dance. During which, the burnt parts of her body fell on various places. Those places are known as Shakti Peeth. It is believed that the goddess’s sacred hair fell here. Another versions of mythology are also there. According to other versions, Katyayani is the Yogmaya power of Vishnu, whom he ordered to be born as the daughter of Nand and Yashoda, while he was born as Krishna to Devaki and Vasudev. Also, the Adya Shastra has established katyayani as the deity of Vrindavan, in its The main Katyayani temple was constructed in 1923. The temple was constructed by Yogiraj Swami Keshvanand Bramachari. Swami Keshavanandji spent about 40 years traversing the snow clad peaks and dales of the Himalayas meeting the existing masters under directions of his Guru Shri Lahiri Mahasay. There he had the vision and direction of the Almighty Mother to proceed to Vrindavan and perform the most important mission of his life by locating the Peethsthan mentioned in the Purans. Pagal Baba Mandir is an amazing temple built in white structure with modern design. The architecture is very appealing. One can witness the evergreen beauty which is around this splendor temple. It is established by Pagal Baba, famously known by his follower. This temple look astonishing and attracts many eyes during Purnima. Many devotees who come to Vrindavan definitely visit this temple because devotees have strong belief that anyone who wish or pray here, definitely get paid off and Lord Krishna and Pagal Baba grand all their wishes. It remains open through the year and at both morning and evening. Prayers are offered two times a day. The main deities are decorated with beautiful clothes and precious jewellery. This temple is also famous due to its puppet exhibition. It is only temple where puppet exhibition is shown in full enthusiasm. It is placed at ground floor of main building. One can see this puppet show throughout the year. At this puppet exhibition, two great epics of India, namely are performed. They enact the complete scenes and famous story of India's great ruler and hero of the ages. People attend this show in great volume throughout the year. Follower of late Pagal Baba take care of this great temple. This temple is artistic in its look and its unique design make it apart from rest of the temples in Vrindavan. Shri Krishna Janmbhoomi is a Hindu temple in Mathura, Uttar Pradesh. The temple is built around the prison cell where Krishna is said to have been born.It is situated next to Kesava Deo Temple and the Shahi Eid Gah Mosque. Photography is banned inside the complex by the government. The site celebrated as the birth place of Krishna. Krishna, as tradition goes, was born in a prison and the prison is said to have existed on the plot marked by a stone plate. To the right of it is the idgah. 1949 The original temple was built by King Vajra, then later rebuilt by Vikramaditya. The temple is said to have been destroyed and rebuilt 17 times in its history. Today the temple is one of the most frequently visited temples in India. The Dwarkadhish temple, also known as the Jagat Mandir and occasionally spelled Dwarakadheesh is a Hindu temple dedicated to the god Krishna, who is worshiped here by the name Dwarkadhish, or 'King of Dwarka'. 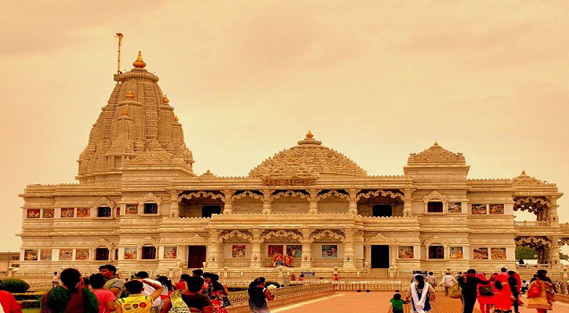 The temple is located at Dwarka, Gujarat, India. The main shrine of the 5-storied building, supported by 72 pillars, is known as Jagat Mandir or Nija Mandir, archaeological findings suggest it to be 2,200 - 2,000 years old.Temple was enlarged in the 15th- 16th century.The Dwarkadhish Temple is a Pushtimarg temple, hence it follows the guidelines and rituals created by Vallabhacharya and Vitheleshnath. According to tradition, the original temple was believed to have been built by Krishna's grandson, Vajranabha, over the hari-griha (Lord Krishna's residential place). The temple became part of the Char Dham pilgrimage considered sacred by Hindus in India, after Adi Shankaracharya, the 8th century Hindu theologian and philosopher, visited the shrine. The other three being comprising Rameswaram, Badrinath and Puri. Even today a memorial within the temple is dedicated to his visit. Dwarakadheesh is the 98th Divya Desam of Vishnu on the subcontinent, glorified in the Divya Prabandha sacred texts. Mirabai temple is situated around 10 kms from Mathura at Vrindavan. It is the place where Lord Krishna spent much of his childhood. The original name of the city Brindavana was derived from the words ‘Brinda’ which means ‘Tulsi’ and "Van". Meera bai came to Vrindavan in 1524 in search of Lord Krishna and His memories. She lived in Vrindavan from 1524 to 1539. Then she left Vrindavan and went to Dwarika to stay there till her death or submerge in Lord Krishna in 1550. Mirabai, since her childhood, became ardent devotee of Lord Krishna. Legend goes that once her mother playfully called Lord Krishna to be Mira’s husband and since then she started considering herself as Krishna’s wife. Mirabai was born in Marwar, Jodhpur in the village of Kurki. Her mother passed away when she was young and her father married her to crown prince of Chittor, prince Bhojraj, the eldest son of Maharaja Sangram Singh. Mira at her performed all her duties towards family but nothing could stop her worship towards Lord Krishna. She went to various temples and wrote and sang songs for Lord Krishna, which was not acceptable to Royal Family. After 4 years of marriage, her husband prince Bhojraj died in a battle and his brother Rana Bikramjit Singh became the ruler of Chittor. He and other family members tried hard to stop Mirabai’s worship but they couldn’t. Feeling defamed, Rana even tried to kill her by sending her poison in a box, when she opened it, it is said that she found a shaligram shila in the box. This black shaligram is kept in Vrindavan in Mirabai temple. Mirabai temple is situated just off the road which opens at on one side and faces Shah Ji temple on the other. While entering Shahji temple, towards left there is a narrow lane by the temple's boundary wall which leads the path to Mirabai temple. It is very simple structure in elegant Rajasthani architecture. The shaligram shila deity can be seen even from the entrance of the temple. People say that eyes, nose, ears, lips can be seen on this shila and the same is worshiped as Lord Krishna. There are many green plants in the courtyard facing the temple. Money plant and some other ornamental green plants are there which surround a small water fountain that generally works only in summer months here. The temple is open for its devotees at 7:30 in the morning hours and closes at 12 afternoon. Again at 5:00 in the evening it opens up and closes for the night at 8:00. Beautiful temple of Shri Krishna in Chhatikara about 8-9 kms from Vrindavan.Here the ride of Krishna Garun is worshipped.A kund is also here.Beautiful place to visit with family. One of the most divine and sacred visits in the Hindu annual calendar of pilgrimages is the Braj Chaurasi Kos Yatra or the 84 Kos Yatra. A ‘kos’ is approximately 2.25 miles or 3.62 kilometres.The “84 Kos parikrama” refers to a roughly 300-km circumambulatory trek or visit to sacred places around Vrindavan along the banks of the Yamuna. Annually, lakhs of devotees or pilgrims (yatris) undertake this yatra in the belief that they are cleansed of their earthly sins and can evil deeds and find a place in ‘parlok’ or heaven.The 84 Kos Yatra is also known as the Braj Bhoomi Yatra as it covers the places and sites connected with the life and events of Krishna. Tourists who visit Agra and Mathura sometimes complete the Braj Bhoomi Yatra on the same trip as a dedication to Lord Krishna. Many others come specifically to do the Braj Bhoomi Yatra as a 4 to 7-day planned itinerary trip.Traditionally, the yatra is undertaken during the monsoon or the month of bhadon; the significance of the rains cannot be overlooked here as Krishna was born on a night of torrential rains when the Yamuna was flooding. So, the most devout undertake this pilgrimage, many of them on foot, during the rainy season. To most people, it is in culmination of a wish fulfilled and offer of thanksgiving; to others it is a kind of penance undertaken for grant of a wish or prayer.The Braj Yatra or Braj Parikrama covers 12 vanas (forests), 24 upavanas (smaller forests or groves), the sacred Govardhana hill, the Yamuna river and various holy sites and gardens along its banks that have been witness to the and heritage of Vrindavan. The yatra forms a circumambulatory (circular) route; in the north the yatra extends to Kotban, towards the west and south-west are Nandgaon, Barsana and the Govardhana hill, spreading to the east along the banks of the Yamuna to the Baldeo temple. All along the route there are many places where ancient temples lie in partially destroyed ruins with idols and artefacts, a mute testimony to the effects of invasion by foreign rulers and dynasties. Legend has it that Yashoda ma and Nand baba (Krishna’s foster parents) were keen to go on a pilgrimage (char dham yatra) and expressed this desire to Krishna. The Char Dham literally means Four Abodes or the four mighty sacred pilgrimage centres of Hinduism – namely Badrinath, Puri, Rameswaram and Dwaraka. Broadly, these four places in the North, East, South and West of India have come to denote the seats of Hinduism (Vaishnavite, Shaivite and mixed). To fulfil the desire of his aged parents, Krishna with his divine powers summoned all the divine aspects of these places of worship and brought them to Vrindavan within a 300-km radius and blessed the land, granting sacred status, thus giving it the name ‘Braj Bhoomi’. Since then, the pilgrimage to this Braj Bhoomi is known as Braj Chaurasi Kos Yatra and any one performing this yatra is believed to be free of the cycle of birth and death and attain nirvana. Another folklore mentions that Brahma cast a spell on Gokul and Vrindavan and spirited away Krishna’s cowherd friends and their cows, to test if Krishna was truly a divine incarnation. Krishna immediately understood this and enacted one his ‘leelas’ or antics, taking the form of his numerous friends, human and animal. Brahma immediately felt mortified at his misdeed and asked Krishna for pardon. In jest, Krishna remarked that he could only atone for his ‘sins’ by going around the sacred land. Thus Brahma became the first one to perform the Chaurasi Kos Yatra; this explains the significance and relevance of the yatra and the inspiration that drives thousands of people to perform it. Nidhvan is one of the most religious places in Vrindavan. It is surrounded by small trees. According to Vrindavan saints, these are not just trees but devotees of Lord Banke Bihari. Nidhivan is also known as Madhuvan. Thousand years ago at the same place a divine saint named as Shri Haridas Ji Maharaj used to please his , Lord Banke Bihari by singing songs and rejuvenating the surroundings of temple by enthralling music. Haridas Ji used to meditate and sing in the praise of his Lord in a secluded and dense forest area in Nidhivan.The Vrindavan saints say that as a result of spiritual penance and aspiration of Shri Haridas, Lord Banke Bihari not only came in his dreams of divine saint but also appeared magically in Nidhivan. Thus the place was spiritually blessed by the lord himself. The spot where Lord Banke Bihari appeared is where The most mysterious conception associated with the place is that, after evening aarti no one is allowed to stay in the temple. It is believed that at the same place, Lord Banke Bihari performs Rass Leela inside the temple at night.If anyone stays in the temple after evening aarti, then he/she becomes deaf, dumb or blind. He/She is not found hale or hearty to disclose the spiritual secret of the Rass leela performed by Shri RadhaKrishna. Even the animals like insects, monkey or birds which crowd the place in the daytime, desert the place as soon as the sunsets.It is now even believed that the saints of the temple even keep two toothbrush, a jug of holy water, 4 ladoos (sweets) and bed ready at night after evening . In morning, all the things are found to be used by someone, which proves that Radha Krishna also known as Priya Priyatama visit the temple at midnight to perform their spiritual activities (Raas Leela). Many worth watching spots are there in the temple area. These spots are the symbol of spiritual presence of Lord Radha Krishna. There is a samadhi of Swami Haridas , the Radha Rani temple. There is also a sacred well of Radha Rani nearby. There is a spot in the temple where Lord Banke Bihari appeared magically. A costume place is also there in the temple, where Lord Radha Krishna used to decorate themselves before performing Raas Leela.